Wind power markets in the Middle East will add 12 GW of new capacity between 2018 and 2027, according to MAKE’s 2018 Middle East Wind Power Outlook. The region will benefit from improved macroeconomic stability, which will generate strong growth for power demand. In addition, a desire to diversify economies, significant reductions in wind power levelised cost of electricity, and a fast-growing population will catalyse wind power market development in the region, the report states. Saudi Arabia, Iran, and Jordan are key drivers of this growth, comprising nearly 70 per cent of total wind power capacity added over the outlook period. 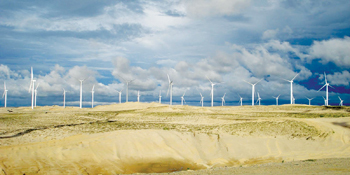 Anticipating its first commercial project in 2019, Saudi Arabia will award 1.2 GW of wind capacity in 2018 and start commissioning projects toward the second half of next year. In Iran, the improving financing environment will support wind market growth after 2020. Backed by its Green Corridor Project, Jordan will add more wind power capacity in 2018 than any other country in the Middle East. The Green Corridor Project II will support the long-term outlook with the construction of necessary grid infrastructure for renewable energy projects. Growth in smaller emerging markets in the region, such as Israel, Lebanon, or Oman, is deeply dependent on performance of individual projects, according to the report. Additionally, reaching political stability in conflict zones like Syria, Iraq, and Yemen will support wind power development in these countries from 2022. In the long-term, political risk and favorable conditions for solar PV may restrict wind power growth in the region. Neither Saudi Arabia nor Iran, for example, have set long-term wind power targets, a fact that could slow market growth from 2023. Moreover, solar PV is rapidly becoming the preferred technology in the region, the report states. The cost position and solar resources in the region create a considerable threat to wind power development. However, as costs for wind come down and a track record is established, wind power development will accelerate. Several large projects are expected to come online in 2018, resulting in significant YoY growth and heralding a period of sustained annual capacity additions in the region. Meanwhile, the Arab Petroleum Investments Corporation (Apicorp), the multilateral development bank focused on the energy sector, published its latest research report which forecasts that the Mena region will require $260 billion of investment to meet rising and suppressed electricity demand. Apicorp’s report also notes that electricity demand and consumption have been growing rapidly in the Mena region, driven by population growth and urbanisation, rising income levels, industrialisation, and low electricity prices; and while economic growth has slowed compared with historical highs, the International Monetary Fund (IMF) still expects an increase of 3.2 per cent in 2018 and 2019, rising to 3.5 per cent in 2022. The region’s population is also expected to grow at an average rate of 1.5 per cent per year in that same period. To meet this rising demand, Apicorp estimates that Mena power capacity will need to expand by an average of 6.4 per cent each year between 2018 and 2022, which corresponds to additional capacity of 117GW. Apicorp forecasts that $152 billion will be needed to deliver this additional capacity.